Histoire générale de l'empire du Mogol depuis sa fondationsur les Mémoires portugais de Manouchi, Venitien. Par le P. Fr. Catrou. 1708. Storia do Mogor or Mogul India 1653-1708 by Niccolo Manucci. Английское издание 1907 года. Раз, два, три, четыре. Чудная история, произошедшая при общении Мануччи с Джай Сингхом. Если не путаю - 1665. Возможно - начало 1666 или вторая половина 1664. A number of planks are joined together by nails in the form of a large enclosed house, with many cannon in tiers. Entering into the said house, the soldiers attach huge cloths to masts, and driven by the winds, these serve to put the said house in motion. The course is regulated by a large plank fixed on the house, and capable of movement from one side to another. In this way, with good matchlocks, pistols, and swords, and a sufficient supply of food, of powder, and of ball, they set out in search of their enemies. When they encounter one, the fight begins with the firing of cannon, which breaks the masts or makes holes in the said house, allowing entrance to the water. But those who are within assemble and with skill plug the hole. For this they always have materials ready. Meanwhile some attend to the vessel, and others fight without intermission. The dead bodies are thrown into the sea, so that they may not hinder the fight. Nor are there wanting surgeons to aid the wounded, who are carried to a room specially set apart. As their courage grows hotter, they bring the vessels nearer, emptying all their matchlocks and pistols, until at length the fight waxing still fiercer, they grapple one with the other; then the sword-blows scatter streams of blood, reddening the sea. There being no mode of flight for the fighters, it is therefore necessary to conquer or die. Sometimes it happens that the captain who is losing, resolving not to be overcome, orders all his cannon and other pieces to be doubleshotted. He then sets fire to the ship's magazine of powder ; thus he destroys himself along with the others. The rajah wondered at such a mode of warfare, and it seemed, to him very hard and very cruel that a man, if he did not want to defend himself, could not even run away. The other mode of fighting was on land. There the foot soldiers were separated from the squadrons of horse, and all had their matchlocks and swords. Those who were mounted had good carbines, pistols, and swords. When I was giving this account, finding some pikes or spears there, I exhibited how the spearmen stood in front of the companies to hinder the cavalry from getting in and throwing into disorder the well-ordered ranks of the infantry. Thus the battle would commence with great order and discipline, the cavalry helping wherever it was necessary to repress an onslaught of the enemy. Many a thing did we tell him of our fighting in the open country. Upon this he set to laughing, assuming us to have no horses in our country, and thus we could know nothing of fighting on horseback. 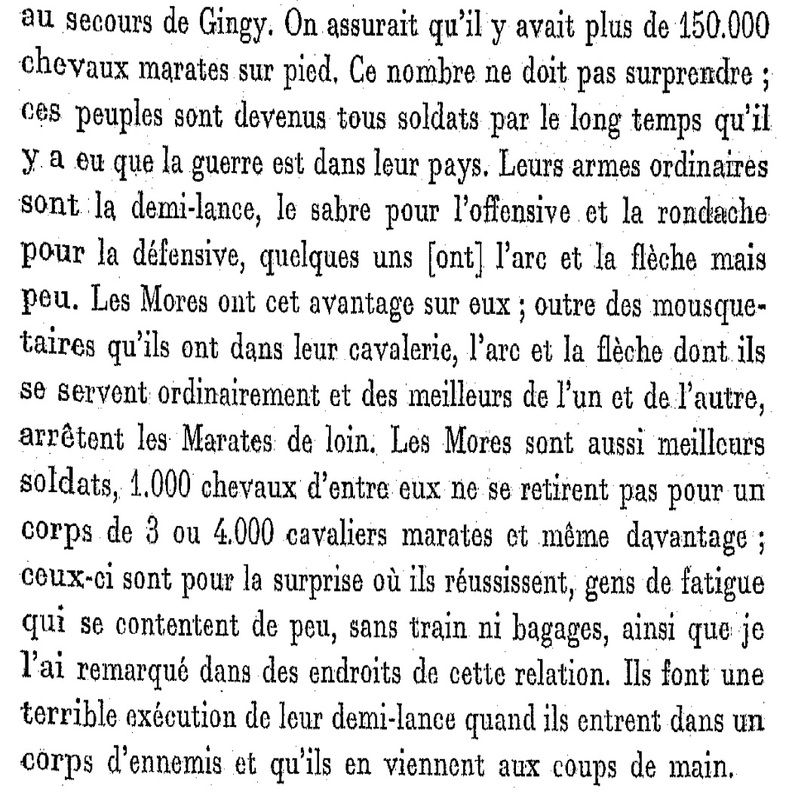 For this reason we agreed, I and Luis Beicao, a French surgeon, Guilherme (William), an Englishman, and Domingo de Saa, a Portuguese who had formerly been a cavalry soldier in Portugal, to give the next morning during the march, and in the rajah's presence, a demonstration of our mode of fighting on horseback. We rode out with our carbines, two pistols in our holsters and two in our waist-belts, and carrying our swords. We rode two and two and began to career about, our horses being excellent. Then first of all we skirmished with the carbine, and after some circling and recircling, letting off our pistols, we made pretence of flight and pursuit. Then, turning round and making a half-circle, the fugitive attacked the pursuer and let off his pistol. Thus we went on till all our charges were fired off, of course without bullets. Then, laying hand upon our swords, we made gestures as if giving sword-cuts, which the others parried. The rajah, who was on his elephant, halted, and when our display was finished, we rode up and made our bow. He asked what meant these excursions and alarms. I replied that purposely we had done this to let him see that we knew how to fight on horseback in the European way. He asked me several times if really they fought like that in Europe. I answered that this was only a small specimen. We would show him sport when it came to reality, observing the same order ; and if there were on the field dead men or horses, we should ride over them as if riding on a carpet, and make no account of them. He praised our way of fighting, saying he thought it a sound mode of warfare, and he should like to form a troop of European cavalry if I could obtain them. I answered that it was not easy to get so many men in Hindustan who had been trained in our wars. He then gave us our leave with a good present, and thenceforth thought more of European nations, who, if it were not for their drinking habits, would be held in high estimation, and could aid our kings to carry out some project there. Memoires De Francois Martin Fondateur De Pondichery(1665-1696). Paris. 1931-4. I-XI, XII-XXIII, XXIV-XXXIII. Том 3, часть XXIX, страница 271. Декабрь 1692-январь 1693. О маратхах. Kamandakiya Nitisara. Между III и VII веками н.э. Издания 1979 года не видел, английский же перевод 1869-го года радует неимоверно. In the Moghul army there was little loyalty to the sovereign's person, and absolutely no patriotism or devotion to one's country. To a slight extent the zeal and fervour of Mahomedanism was on the side of the ruler. But in a country where the majority were still Hindus, any excess of this feeling was as much a danger as an advantage. In a faint degree, there was some attachment to the reigning house, which still lived on the reputation of such great rulers and soldiers as Babar and Akbar. But Aurangzeb had alienated both the Rajput warrior clans and the general Hindu population. The army was thus, in effect, a body of mercenaries, men who served only for what they could get, and ready at any moment, when things went badly, to desert or transfer themselves, to a higher bidder. The army was full of Persian, Central Asian, and Afghan soldiers of fortune, whose swords were at the service of any one who chose to pay them. By its original constitution everything turned, in such an army, upon the characler of its head. If he were an able and successful soldier, or even one gifted with the power of leading and governing men, all went well, some sort of discipline was maintained, and some unity of purpose was secured. Thus the first necessity was a strong emperor; for no one but the emperor was readily obeyed, and even he could not always secure obedience. But after the death of Aurangzeb in 1707, efficient rulers ceased to be found among the scions of Taimur's house. A free field was thus opened to the jealousies and rivalries of the nobles. All courts seem more or less hot-beds of petty intrigue; but in eastern countries this evil growth seems to find its most congenial soil. Intrigue seems to accord with the genius of eastern races; and in that respect perhaps no eastern country equals India. My experience of India is that if a man has only two servants, one of them will at once attempt to supplant the other and monopolize his master's confidence. Disastrous consequences followed from these jealousies among the great men and nobles. As one writer aptly says a noble was hasad-peshah, "one whose profession was envy". In military matters we have not to go far in our search for examples of this jealousy and its consequence, base treachery. At Jajau in 1707, Zulfiqar Khan left A'zam Shah to his fate, because he had been made to serve under Bedar Bakht, that prince's son. Again, in 1712, the same Zujfiqar Khan stood aloof at Agrah, in the hope that his rival, Jahandar Shah's foster-brother, might be destroyed, leaving him to reap the benefit of an unshared victory. In this same battle we see treachery at work, the troops of Turani race having been bought over by the other side. Instances might be multiplied ad infinitum. Furthermore, the constitution of the army was radically unsound. Each man was, there can be no doubt, individually brave, even to recklessness. 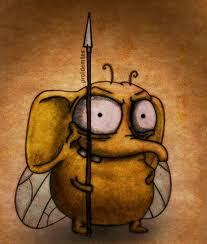 Why then do we find them so ready to retreat from a battle-field, so anxious to make off after the slightest reverse? Simply because they had so much to lose and so very litlle to gain. A trooper rode his own horse, and if it was killed he was ruined irretrievably. As a European writer of the middle of the 18th century justly enough says: "Their cavalry (which are among them very respectable, and also well paid) though not backward to engage with sabres, are extremely unwilling to bring their horses within the reach of our guns; so that they do not decline' so much through fear of their lives, as for their fortunes, which are all laid out in the horse they ride on", Cambridge, "War", Introd. viii. 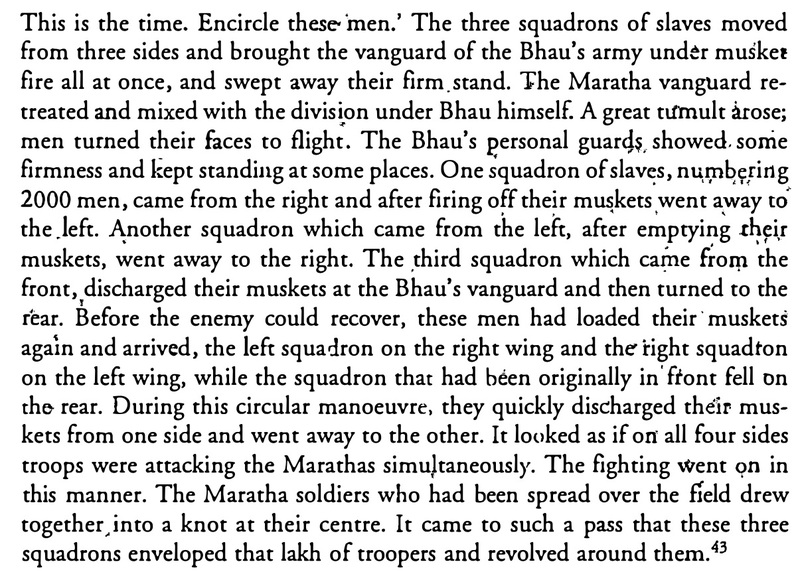 In 1791-2 Moor, 204, noticed among the Mahratta cavalry that the same cause produced the same effect. "A reluctance to charge will be frequently observed; which does not proceed from any deficiency in personal courage, but from this cause: a great part of the horses in the Mahratta service are, we have understood, the property of the riders, who receive a certain monthly pay, according to the goodness of the horse, for their own and their beast's services. If a man has his horse killed or wounded, no equivalent is made him by the Sirkar, but he loses his animal and his allowance; he will therefore, of course, be as careful as possible to preserve both". See also Seir, i, 315, note 250, Orme, ''Hist. Frag. ", 418, Fitzclarence, "Journal", 73, Blacker, "War", 21. Then in addition to this hindrance to zeal caused by his personal interests, we lind that the individual soldier did not look to the sovereign and the State, or consider his interests identical with theirs. He was the soldier of his immediate commander and never looked beyond him. If a great leader was luke-warm in the cause or was bought over, was forced to flee from the field, or was slain in the battle, his men dispersed at once. With the leader's disappearance, their interest in the fight was at an end, and their first concern was their own and their horse's safety. To take one instance out of many, Sayyad Husain Ali Khan left Agrah in Muhammad Shah's train at the head of as large a force as had ever been collected by any Moghul general. A week or two afterwards, he was suddenly assassinated. An hour or two had hardly elapsed, and not a trace of his mighty army was left, his camp had been plundered, and even his tents burnt. The death or disappearance of the general-in-chief always decided the battle. 18 век, у Моголов нет сильных и харизматичных лидеров. 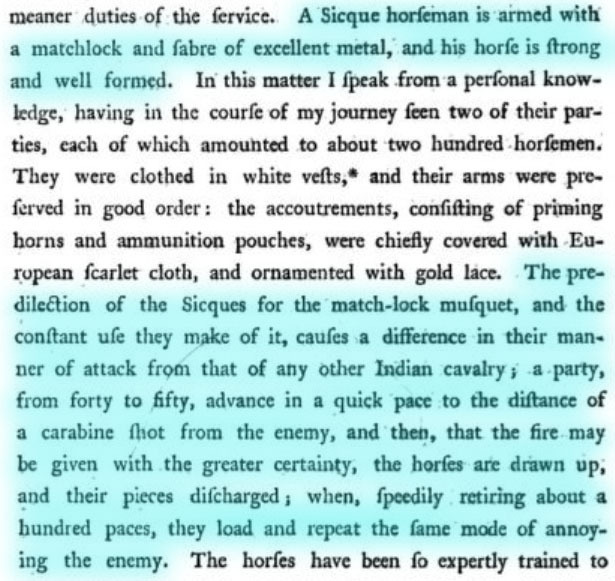 Speaking of the Nizam's army, a writer at the end of the 18th century says: ''As an army, the composition is no less expensive than defective and totally unfit for military operations. 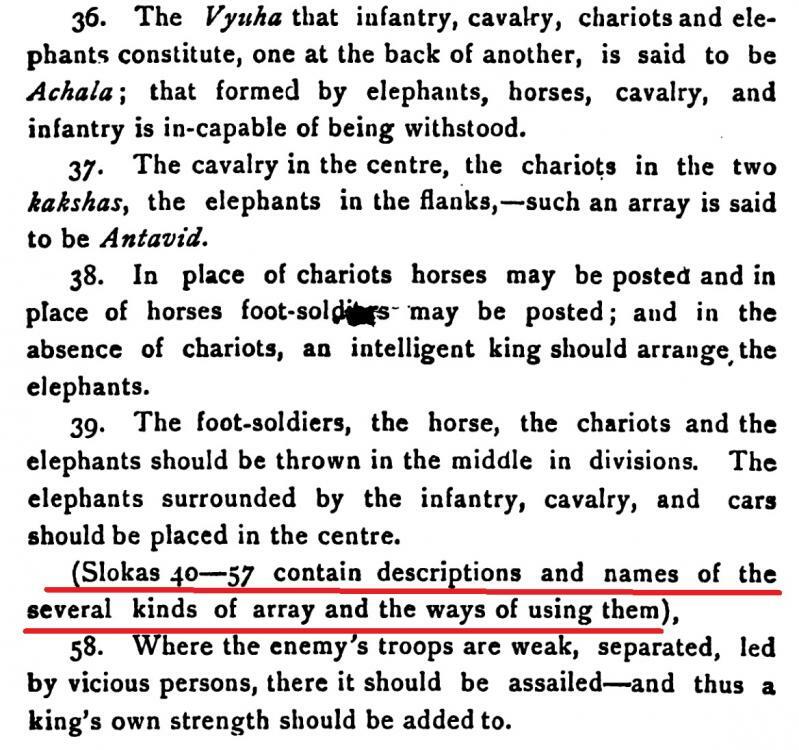 They encamp at random, without proper pickets in front, flank, or rear, and in consequence of this and other negligence are easily to be surprized — in short, these numerous bodies of robust men and active horse, seem designed for no other purpose than tp adorn the march of their chief, who rides in the midst of them, upon one elephant, his standard displayed upon another, attended by chobdars calling out his titles". No orders were given for a march; word of them was conveyed to each chief by his news-writer, who attended the darbar every evening. Little attention was paid to merit; preferment was obtained through birth and connections, intrigue, cabal, and other means equally destructive to military character (Ouseley's "Oriental ColIections", 1795 i, 21-32). Similar comments are to be found in the chapter on war in R. Orme's paper on the government and people of Indostan (''Hist. Frag." 417—420). In short, excepting want of personal courage, every other fault in the list of military vices may be attributed to the degenerate Moghuls: indiscipline, want of cohesion, luxurious habits, inactivity, bad commissariat, and cumbrous equipmeht. In fact, Mountstuart Elphinstone, in his "History", 579, gives us succintly the conclusion of the whole matter, "They formed a cavalry admirably fitted to prance in a procession, and not ill-adapted to a charge in a pitched battle, but not capable of any long exertion, and still less of any continuance of fatigue and hardship". Параллели на Западе эпохи Тёмных веков. Guy Halsall. Warfare and society in the barbarian West, 450–900. The eventual victory of the Carolingians was due in no small part to the military abilities of Charles Martel. That victory was not preordained however, and the assumption of the title of king by Charles’ son Pippin in 751 caused much tension and necessitated a great deal of ideological effort aimed at its legitimation. Constant and successful campaigning was also vitally important in binding powerful and potentially rival aristocratic families and factions to the new régime. Thereafter, Carolingian kings always had to be active war-leaders, and most were skilled commanders. Problems, as elsewhere in early medieval Europe, began when expansionist warfare ended. The Visigothic kingdom’s problems, with repeated usurpation and civil war, have similarly been associated with the end of the possibility of aggressive warfare against neighbouring realms. The penalties for failure could be high. One of the best-known vignettes in Fredegar’s Chronicle depicts the young Merovingian king, Sigibert III, sitting on his horse, weeping at the destruction of his army by the rebellious Thuringians under their duke, Radulf. As a result of this defeat, effective Merovingian hegemony over the peoples beyond the Rhine collapsed, although, as has been very clearly demonstrated, this did not mean that the élites of these areas ceased to be interested or involved in the politics of the Frankish world. On another occasion, the Mercian king, Æthelbald, was defeated by the West Saxons at the battle of Burford (752). This defeat may have temporarily cost Æthelbald his overlordship in southern Britain, although the king of Wessex appears as a witness to one of his last charters, suggesting that hegemony had been restored. It probably, however, cost Æthelbald his life; four years later his own bodyguard did him to death at night. A failure in battle against external enemies could apparently lead to internal rivals attempting to seize power. Kings of the Asturias often went into retirement, voluntary or forced, if unsuccessful or unable to lead the army against the Moslems. At the end of the ninth century the political crisis which produced the breakup of the Carolingian empire was initiated in no small measure by the perceived failure of Charles III, ‘the Fat’, to defend his empire effectively against the Vikings. It has been very cogently argued that Charles’ military policies were well thought through, and in many ways continued those of his predecessors; in some regards he may actually have been no less successful than other kings. Charles’ problem stemmed from the fact that he was unfortunate enough to be seen to fail in campaign against Vikings besieging Paris, the political centre of West Francia, whilst a powerful aristocrat from one of the most politically dangerous West Frankish dynasties, Odo, son of Count Robert the Strong, led a spirited, successful and, to some contemporaries, heroic defence of the city. Charles was seen as failing to help the beleaguered city in its hour of need. Modern analysis of the campaign can show that Charles’ campaign was in many respects no different in its methods, and no less successful in its results, than many earlier or later campaigns against the Vikings, who, as will become clear, were very difficult foes. Yet to contemporary writers it was, rightly or wrongly, seen as a dismal failure and therefore the cost to Charles and the Carolingian dynasty was high. These writers, it has been shown, were hostile to Charles largely for their own reasons. Nevertheless, ninth-century politics was not governed by objective strategic analysis. Carolingian kings were expected to win battles, and by failing in a high-profile campaign at just the time when his enemies were winning heroic laurels, Charles presented his enemies with a golden opportunity to denigrate his abilities as king. Within a year or so he had been deposed by his nephew, Arnulf of Carinthia, who took over rule of the East Franks, whilst Odo himself replaced Charles as king in West Francia. The rudeness of the military art in Indostan can scarcely be imagined, but by those who have seen it. The infantry consists in a multitude of people assembled together without regard to rank and file: some with swords and targets, who can never stand the shock of a body of horse: some bearing matchlocks, which in the best of order can produce but a very uncertain fire: some armed with lances too long or too weak to be of any service, even if ranged with the utmost regularity of discipline. Their messengers will go fifty miles a day, for twenty or thirty days - without intermission. Their infatry march faster, and with less weariness, than Europeans; but could not march at all, if they were to carry the same baggage and accoutrements. Малость по войскам "европейского строя" в Индии. Раннее использование пороха в Индии. George Forster, A Journey from Bengal to England through the Northern part of India, Kashmir, Afghanistan, and Persia and into Russia, by the Caspian Sea, 1782–84. Книга была впервые напечатана в 1798 году. Том 1, страница 288. A Sikh horseman is armed with a matchlock. . . . The predilection of the Sikhs for the matchlock musket, and the constant use they make of it, causes a difference in their manner of attack from that of any other Indian cavalry; a party from forty to fifty, advance in a quick pace to the distance of a carbine shot from the enemy, and then, that the fire may be given with the greater certainty, the horses are drawn up, and their pieces discharged; when speedily retiring about a hundred paces, they load and repeat the same mode of annoying the enemy. Цитата из Jean Law de Lauriston, Memoires sur quelques affaires de l'Empire Mogol 1756-1761, Paris,1913, p. 194. Перевод автора. Описание индийского войска 1757 года. They gather as many horsemen as they can muster, make a few advances and occasionally fight out of conviсtion, although most do so only in the hope of a fortunate event that might bring them compensation. Ils rassemblent ce qu`ils peuvent de cavaliers, font quelques avances ey se battent quelquefois par attachement, mais le plus grand nombre dans la seule esperance d`un evenement favorable qui pourra les dedommager. the cavalry are not backward to engage with sabres but are extremely unwilling to bring their horses within the reach of our guns, not so much through fear of their lives as for their fortunes which are all laid out in the horse they ride. Афганские "рейтары". Ссылка стоит на Nur ud-Din Hussain Khan Fakhri, "An Original Account of Ahmad Shah Durrani's Campaigns in India and the Battle of Panipat' (Tawarikh-i Najib ud-Daulah), trans. J. Sarkar // Islamic Culture, Vols 7, 3, 1933, pp 452-3. Скана полной статьи пока не нашел. Надо искать дальше. Третья битва при Панипате. 1761 год. Автор пишет, что в 18-м веке конных стрелков из лука в Индии и Афганистане было мало, воины предпочитали огнестрельное оружие. Ружья у гулямов Дуррани не фитильные, а кремневки, с микелетами или европейскими замками. Популярны были мушкетоны большого калибра. Подпирала стрелков традиционная афганская конница - клинки и пики. Предполагается, что массовое использование замбуреков в регионе - также от афганцев. F. Colombari, Les zemboureks: Artillerie de campagne a dromedaire, employee dam l'armee persane, Paris, 1853, p. 292. The very effective use of the zamburak at Gulnabad is confirmed by the contempora ry sources, L. Lockhart, The Falt of the Safavid Dynasty and the Afghan Occupation of Persia, Cambridge, 1958, pp 131, 141. P.S. В The Encyclopaedia of Islam есть здоровая статья "HARB" по военному делу. Пока не смотрел - но поглядеть нужно обязательно. a party from forty to fifty, advance in a quick pace to the distance of a carbine shot from the enemy, and then, that the fire may be given with the greater certainty, the horses are drawn up, and their pieces discharged; when speedily retiring about a hundred paces, they load and repeat the same mode of annoying the enemy. Похоже, что несколько ранее в Центральной Азии этот способ применяли джунгары - на некоторых картинах видны массы стрелков из ружей, сближающиеся с китайскими войсками. Процесс отхода не показан, но, надо думать, после выстрела им было некуда деваться и они попросту отступали для перезарядки. Из Шейзара в этот день выступило много пехотинцев. Франки бросились на них, но не могли выбить их с места. Тогда Танкред разгневался и сказал: “Вы — мои рыцари, и каждый из вас получает содержание, равное содержанию ста мусульман. Это “сердженды” 173 (он разумел пехотинцев), и вы не можете выбить их с этого места!” — “Мы боимся только за лошадей, — ответили ему. — Если бы не это, мы бы их затоптали и перекололи копьями”. — “Лошади мои, — сказал Танкред, — всякому, у кого будет убита лошадь, я заменю ее новою”. Тогда франки несколько раз атаковали наших пехотинцев, и семьдесят лошадей у них было убито, но они не могли сдвинуть наших с места. Т.е. прецеденты такого рода были известны уже ОЧЕНЬ давно, но консерватизм делает с людьми нечто странное. Остается только гадать - и что же такое оружие известно аж с XVI в. и отнюдь не от афганцев? Популярны были мушкетоны большого калибра. Автор пишет, что в 18-м веке конных стрелков из лука в Индии и Афганистане было мало, воины предпочитали огнестрельное оружие. При распространении огнестрельного оружия лук быстро выходит из широкого употребления, т.к. владению им надо долго обучаться. Ружья у гулямов Дуррани не фитильные, а кремневки, с микелетами или европейскими замками. Популярны были мушкетоны большого калибра. Подпирала стрелков традиционная афганская конница - клинки и пики. У шведов, кстати, против залпов рейтар было действенное средство - быстрая атака в палаши. Помогало. Думаю, просто раджпуты были неготовы морально к залпам с быстрой дистанции и дрогнули. Надо еще сказать, что быстрое перезаряжание и готовность массы из 2000 всадников к повторному заезду - дело очень небыстрое. И думать, что они так вот толпой скакали - это, мягко говоря, странно. Чтобы все 2000 ружей отстрелялись, надо иметь какую-то систему ведения огня. У рейтаров это было караколе. А тут просто необходимо правильно распределить воинов при стрельбе. Иначе половина перестреляла бы друг друга. У меня такое впечатление, что европейцы 18-19 века писали про "боятся за личных коней" едва не на автомате. Специально списков не составлял - но про персов 18 века такое видел, про индийцев, про турок. Там не про "изобрели", там про массовое использование в полевом бою верблюжьей артиллерии. Собственно замбураки афганцы не изобретали, да и артиллерией обзавелись довольно поздно, про это автор пишет. Но тут у меня сразу скепсис вылез, если честно. Просто автор-то эту сентенция выдал, когда описывал именно войны Дуррани в Индии - с основным противником в лице маратхов. Но маратхи исторически не конные стрелки из лука. Они ими и до 18 века не были. То же самое и по афганцам (в качестве этнонима в ту эпоху - это узко пуштуны) - не помню упоминаний про то, что они были прославленными мастерами стрельбы из лука с коня. ИМХО, скорее всего эта масса все-таки распадалась на отряды, которые вылетали из строя, стреляли и отступали. Как в примере выше про сикхов - несколько десятков. И, есть подозрение, что сама организация обстрела вряд ли сильно отличалась от действий конных лучников. Скорострельность меньше - но и все, кажется. Из описания следует, что 3 отряда по 2000 воинов скакали стрелять разом, каждый в своем направлении. Один скакал с левого фланга на правый, второй - с правого на левый (как они так ухитрились встречно скакать, стрелять и не перестрелять друг друга? ), а тот, что с фронта, отступил после залпа назад и перезарядился. У ойратов тоже на картинах в фронтальную атаку валит аморфная конная масса с ружьями, но тут на условности изображения списать можно. ИМХО, такие маневры эффективны только в условиях, если у противника нет достаточного количества ружей и луков. Т.е. джунгарские наскоки на цинские войска были обречены (итог войны известен). С раджпутами, видимо, такая фишка могла проскочить. Тут описание, имхо, все-таки не предел подробности. Чтобы "разом стрелять" - нужно в шеренгу растягиваться. Тогда каждый отряд будет километра по 3 занимать, минимум. Плюс, насколько понимаю, в регионе войска все-таки "кучей" не строили. Кстати - "вышли справа - ушли влево" чем-то похоже на текст Мубаракшаха. Оригинала текста у нас на руках нет, поэтому может статься, что или мы чего-то недопонимаем, или рассказчик чего-то начудил. ИМХО, такие маневры эффективны только в условиях, если у противника нет достаточного количества ружей и луков. Прозоровский примерно в это же время в сходных выражениях описывал тактику турецкой конницы. Конница их, имеет хороших лошадей и соответствующих седаков, но атака их состоит в том, что прискачут толпами с великою наглостью на карабинерной выстрел и, рассыпавшись по всему фронту, а особливо на фланги, начинают стрелять из ружей. Чрез сие всякой военной человек заключить может, что сия атака совсем для конницы не полезна, для чего крайне нада фланги беречь, естли не иначе, то вторую лини иметь не менее 600 шагов от первой и лутче средину оной с большим интервалом. Чем лутче фланги первой линии закрыты и в случае нещастия первой линии могла б оная в интервал проехать, а вторая линия неприятеля взять во фланги. Однако ж вернейший и необходимый способ, чтоб конницы одной противу их не употреблять. Как места, где война с ними бывает, большею частью открыты и наполнены только сухими оврагами и падинами, так натурою фланги уверить невозможно или редко где то представится. А имев пехоту по флангам в каре, хотя б оные из неболыпова числа были сочинены, тогда уже фланги останутся без всякой опасности. Так турки пехотного огня сносить не могут. Итак нет другого построения фронта противу их, как пехоту иметь в несколько каре, а конницу между оными, то есть в армии, расчисляя по числу своих войск и положению земли, как атака их состоит только в том, что окружать противное войско конницей. Потому что именно тогда и приходит кирдык нашей коннице - охватывают эскадрон, расстреливают, рубят, берут в плен. Таким же образом и на Кавказе действовали - против кабардинцев или кого еще просто так драгун не бросали, а только с условием предварительного обстрела из пушек, и при поддержке пехоты и казаков. В начале войны, в 1800-е, было несколько крупных конных сражений, но там почти исключительно действовали донские казаки, что несколько уравнивало шансы. И да, почти всегда сзади несколько пушек и некоторое количество пехоты присутствовало. Для опоры наших казаков. Пара "диковин", которые не понимаю, но которые не только существуют, но и встречаются на миниатюрах XVIII в.
С прыжками этими не очень понятно. Хотя есть предположение (не мое), что в подобные "ката" могли включаться и не чисто боевые элементы. Часть там - простая гимнастика, совмещенная с фехтовальными приемами, если не путаю. Сейчас у меня одна лежит - длинная (128 см. ), но узкая (33,5 мм.) и очень гибкая (у основания всего 3 мм.). Как ей рубить, как можно сражаться? Рубить и колоть, насколько понимаю, никак. Только полосовать. А это точно боевое оружие было? Просто видел фотографии паты на манер "катар-переросток" - но они, насколько понимаю, куда короче этого экземпляра, и толще, шире и жестче. Я разные видел. С разными клинками. Я разные видел - и широкие, и с более жестким клинком. Но все равно - оружие-загадка. Иконография минимальна, описание, ЕМНИП, только 1 (ОДНО), да и то, не в боевой обстановке сделанное. Описание от 1829 г. - показательное выступление с патой демонстрировал сипай из 39-го полка бенгальской пехоты по просьбе английского начальства, "заказавшего" сипаям продемонстрировать разные традиционные военно-атлетические игры, в т.ч. фехтование на мечах с щитами, борьбу и пресловутое выступление с патой. Дело было в провинции Каттак, входящей в состав Бенгалии. Кстати, иконография на 90% - изображения махараджи маратхов Шиваджи, который жил в 17 веке. И ранее 17 века я изображений не знаю. Есть еще одно изображение, не относящееся к Шиваджи - но там предположительно пата у всадника, т.к. разрешение изображения не сильно хорошее. И есть пата на одном из портретов Шиваджи, которая длиной примерно как кутар. Чуть длиннее.